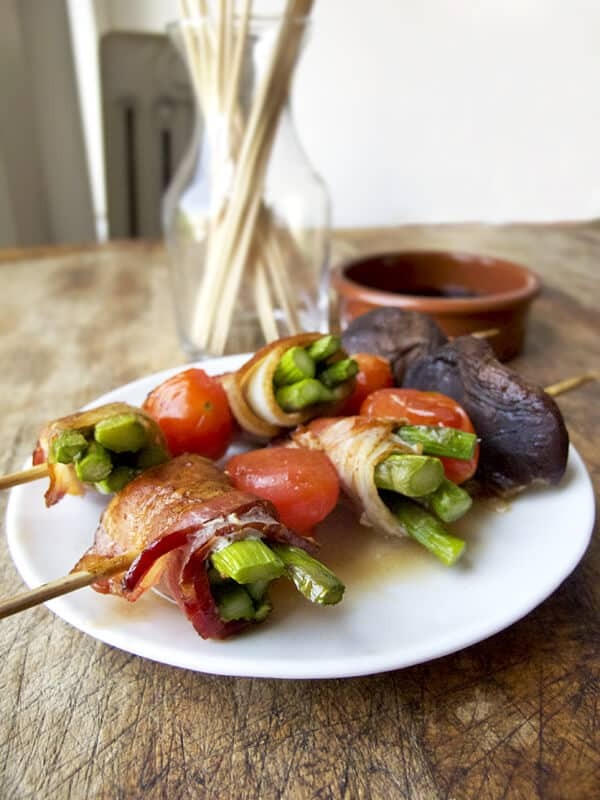 Aspara bacon is a traditional Japanese yakitori bar fare made of asparagus stalks wrapped in bacon served on skewers. By now you know how much of a yakitori fanatic I am and how much I enjoy making it at home. The ease and convenience that comes from threading chopped pieces of veggies and meats and leaving it up to the oven to do its magic, is incomparable to slaving over a hot stove stirring pots of bubbling sauces and panfrying meats. When you have a very busy day, roasting is a blessing on many fronts: You can bake with very little oil which means dinner will be low fat. Flavors will naturally develop as meats and veggies are left sizzling and charring, which means a pinch of salt and pepper is probably all you need for seasoning. Lastly, you are not restricted to following a specific recipe, which means you can open up your fridge, grab whatever you have and throw it all on a big metal tray with a drizzle of olive oil if needed. 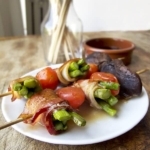 Hence, my love for easy yakitori like this aspara bacon recipe (bacon wrapped asparagus). Aspara bacon is a combination I’ve loved since my first trip in Tenjin, a bustling downtown area of Fukuoka, Japan. It’s an extremely popular item on yakitori menus throughout the country. And it comes as no surprise: Japanese people adore pork more than if Anthony Bourdain and David Chang were combined into one human being. Fukuoka is a great place to be if you love pork as much as I do since they specialize in the famous tonkotsu ramen. Cloudy, rich and creamy pork base soup, heaven in a bowl for all ramen lovers. 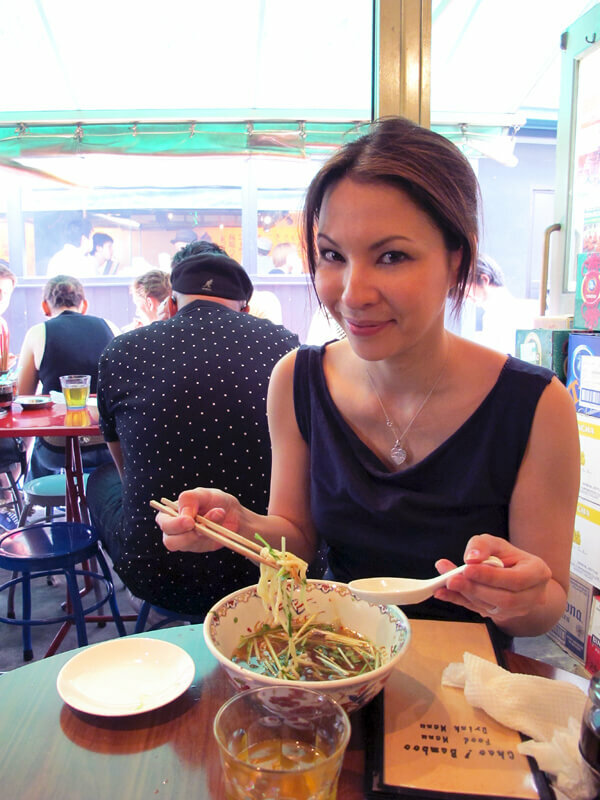 Known for making some of the best food in Japan, it always surprises me how little people know about Japan’s 6th largest city – especially foodies! Whenever Ben and I take a trip there (to visit my mother and relatives), we cannot wait to get off the plane and dive head first into jars of mentaiko (spicy cod roe), curry pan sandwiches, tonkotsu ramen, plates of yakiniku and our hourly trips to Seven Eleven, where rows and rows of tantalizing snacks appeal to our gluttonous tendencies. Want proof? Me, eating an insanely good bowl of cold noodles. Me, eating my favorite Spicy Mos Cheeseburger. Me, stuffing my face at 1am in my mother’s kitchen with pickles, rice and seafood snacks. There’s never enough meal time to get through our list of dishes ‘to eat before going back to NYC.’ The only option left is to gain a few pounds and add mid-lunches and late night after-dinner-dinners to our schedule. Thankfully, smaller, tapas style meals are widely available, so we can sit and order a couple of skewers of aspara bacon along with a few other favorites (tsukune, heart, wings, skin) and move on to the next destination. To us, Japan is a land where every single person is a foodie. People talk about food while they are eating lunch and thinking of what to have for dinner. My mother’s friend took us to a place an hour away just so we could try the area’s most famous choux creams (cream puffs). That’s how dedicated they are to good food. 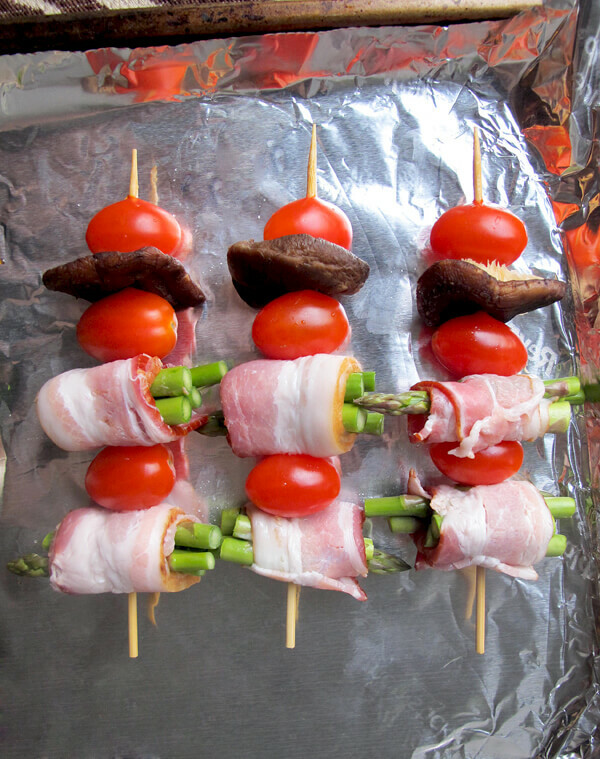 Healthy and easy oven baked aspara bacon and cherry tomato kebabs. Makes 10 skewers. 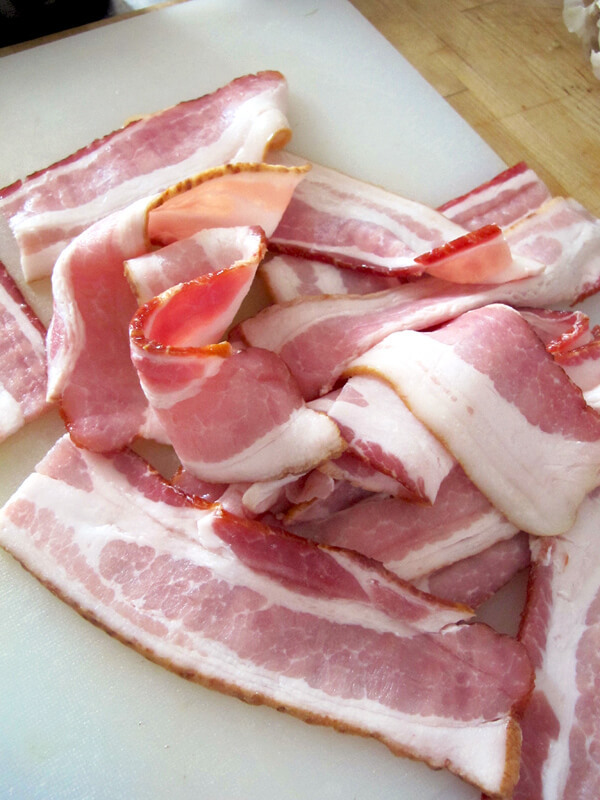 Cut bacon slices in a half, widthwise. 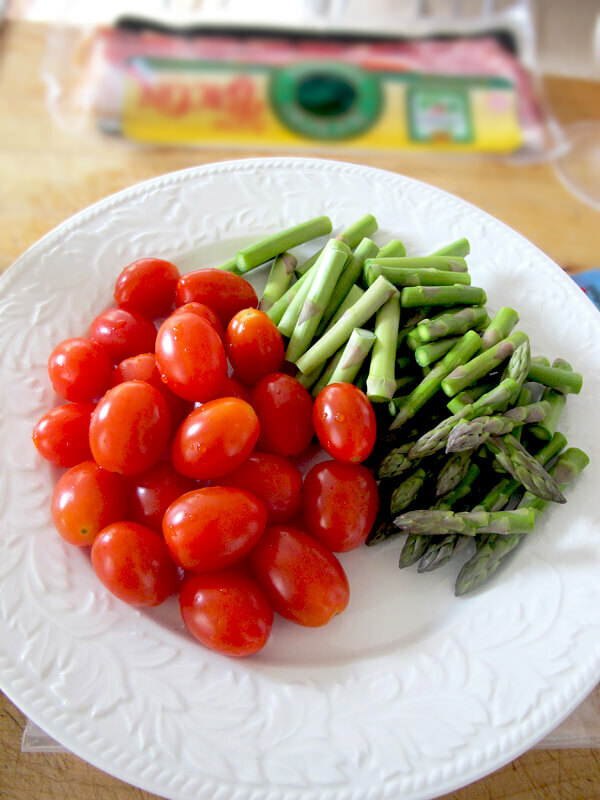 – Cut asparagus stalks into quarters. 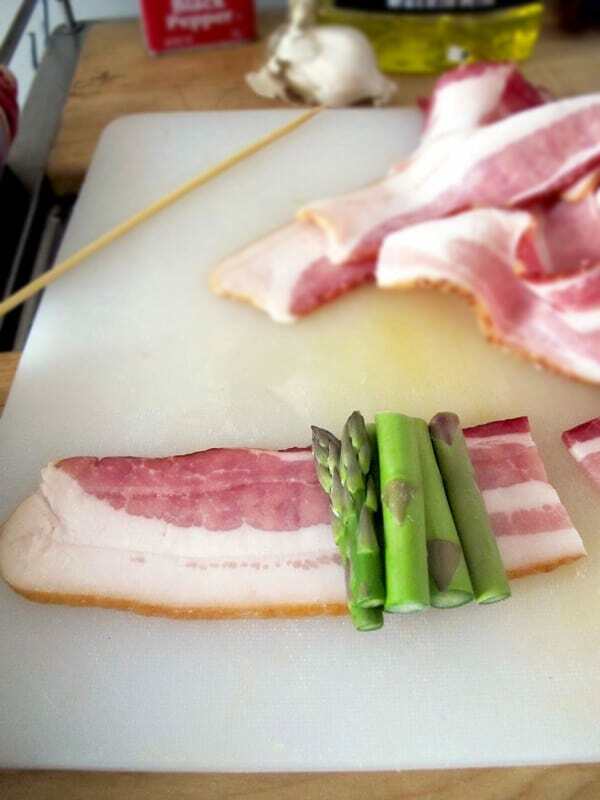 Lay one slice of bacon on a flat surface and add 4 pieces of asparagus at one end of the slice. 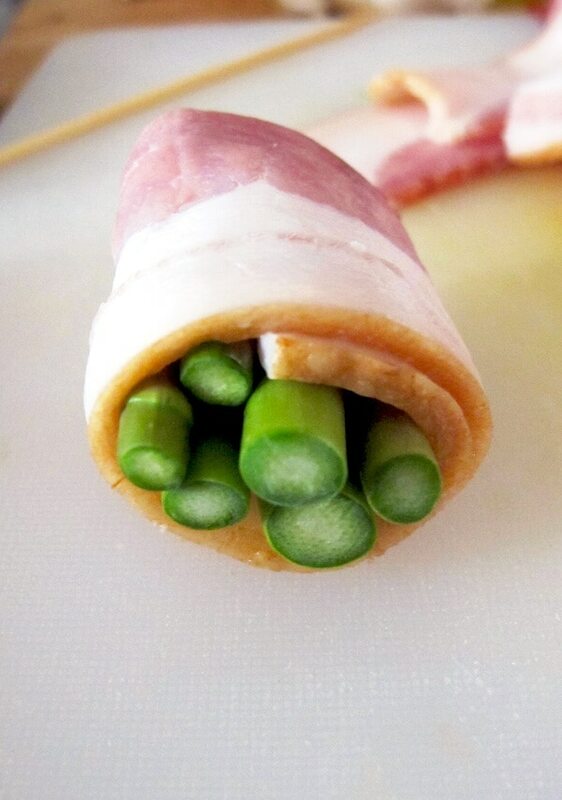 Slowly wrap bacon around asparagus (in a rolling motion) and set aside. Repeat until all the bacon and asparagus have been used. 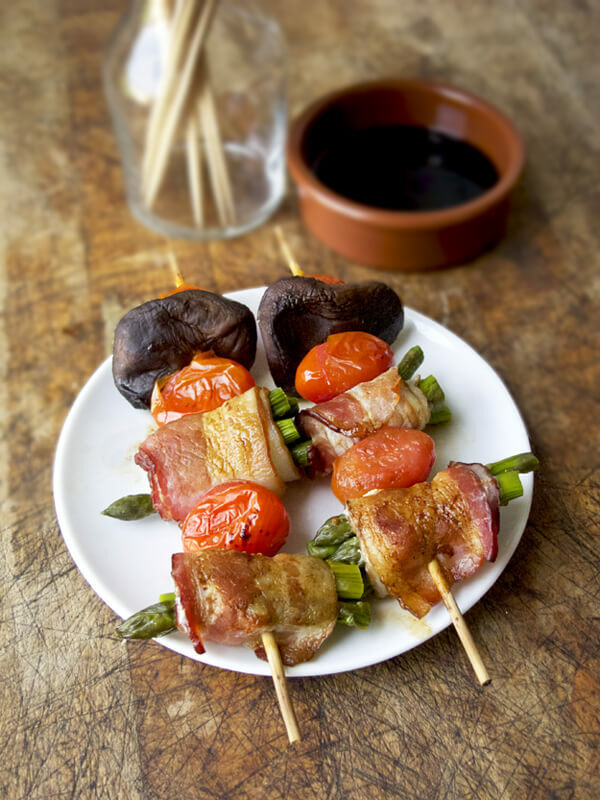 Thread each skewer with bacon wrapped asparagus, cherry tomato, bacon wrapped asparagus, cherry tomato and finish with a shiitake mushroom. Put foil on a sheet tray and lay each skewer on it, in a single layer. Bake for about 20 minutes, until bacon is sizzling and a nice golden brown. Take out of the oven and sprinkle a little rock salt on top. Serve hot.